I also hosted Baby Book Clubs in both Blackrock and Dalkey libraries. We read Farmer Duck (and made some wonderful farm animal noises) and glued and drew some great ice lollies to celebrate the lovely September weather. We had a very successful Dahl Day for schools, with a show and workshops. Thanks to all the teachers for bringing their students. Here's Grainne Clear as Little Red Riding Hood and below are Enda Reilly and Erin Fornoff as The Twits. Three Canadian writers visited us in September and spoke to local school children about their work, JonArno Lawson, Sydney Smith and Katherena Vermette. I also took part in Culture Night with Alan Nolan and we created a story with lots of families who were visiting the library for the night. Writing Club also started in September and our young writers are working on some great stories already. 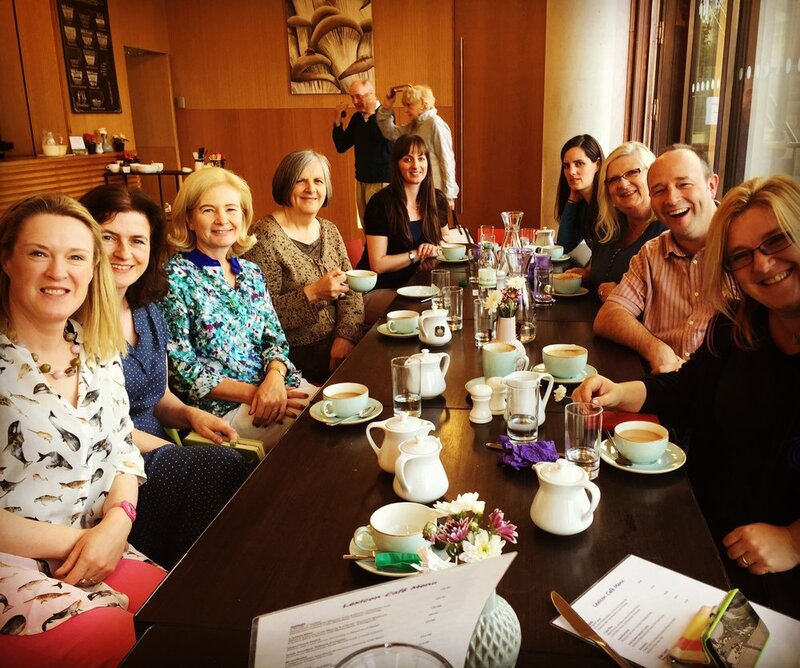 Towards the end of September we had a very special day for Irish children's writers - our Lexicon Lunch for Children's Writers. I invited children's writers from all over the country to join me in the Lexicon and I was delighted that so many turned up to talk about books and writing and to see my Writer in Residence room. I got the chance to interview Eoin Colfer, Judi Curtin and Marita Conlon-McKenna on camera - watch out for those videos soon. Pictured below are Sheena Wilkinson, Judi Curtin, Siobhan Parkinson, Erika McGann, Natasha Mac a'Bhaird, Marita Conlon-McKenna, Alan Nolan and Ruth Long. The Teen Creatives had a visit from the amazing Dave Rudden who told them all about writing, creating characters and plotting a brilliant book. And finally I launched two books, one by Judi Curtin, the other by ER Murray and I hosted the first of my Drop In sessions for writers and was delighted to meet some wonderful young writers, and some adults who are writing for children. During September I wrote the first draft of a picture book for very young children in my Writer in Residence room, worked on two other picture book ideas, and did some research on a new novel. The library is an ace place for research as I'm surrounded by wonderful reference books and ultra helpful librarians. October is busy too - stay tuned for my next diary in early November and for the first of the Writer in Residence video blogs. To find out more about any of the book or writing clubs email: dlrlexiconlib@dlrcoco.ie. To book a Writing Clinic slot email me: sarahsamwebb at gmail.com - next clinic is Wed 26th October between 3pm and 5pm. I'm delighted to be hosting a wide range of events, clubs and workshops for children, teens and adults during my residency. Here are the events from now until the end of the year. 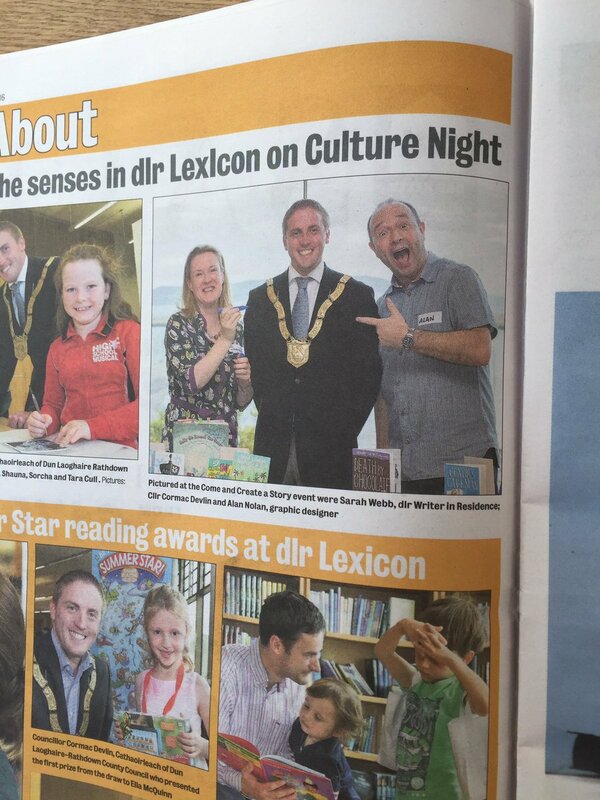 I hope to see you at the dlr Lexicon very soon! Events and workshops inspired by the work of Roald Dahl with Oisin McGann, Alan Nolan, Grainne Clear and Enda Reilly. 5pm to 7pm Story and art fun for all the family with Sarah Webb and Alan Nolan – no booking required. School events with award winning Canadian writers and illustrators, JonArno Lawson, Sydney Smith and Katherena Vernette. Find out how a book is made with our international guests. Do you love reading? Would you like to chat about stories and characters with fellow young book lovers? Whether you’re a Harry Potter fan, or eat up Judi Curtin or David Walliams books, this is the club for you! For our first meeting we’ll be talking about our favourite Roald Dahl book, in honour of his centenary on 13th September. Do you love writing stories and poems? Would you like to find out more about creating fantastic characters and gripping plots? Then this is the club for you! Teen Creatives is for all teenagers who love to write and draw, and would like to learn how to create video blogs and edit movie clips. We will be talking about how stories work, writing, drawing, cartooning, making short movies and vlogs, and exploring the practical, behind the scenes side of the arts world, from hanging an art exhibition to curating a book festival. Artists, writers and arts curators will be invited to talk to the group about their work, such as writer and cartoonist, Alan Nolan and award winning writer, Sheena Wilkinson. Are you a young writer?Would you like our writer in residence, Sarah Webb to read your work and offer advice? Drop in to her writing clinic. No need to book. Please bring a copy of your work for Sarah to read. Children under 12 must be accompanied by an adult. Are you an adult who is writing for children or teenagers? Would you like some help and advice? 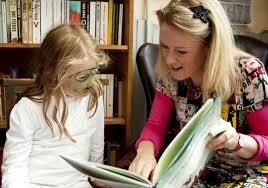 Our writer in residence, Sarah Webb is hosting writing clinics for emerging children’s writers. No need to book. Sarah is happy to read short extracts from manuscripts during the clinic. Please bring a print out of your work.